From a distance, it might look like Jerry Seinfeld leads a charmed and happy life, but a heartbreaking story coming out of Hollywood today proves that even the legendary stand-up comic has his fair share of hardships. 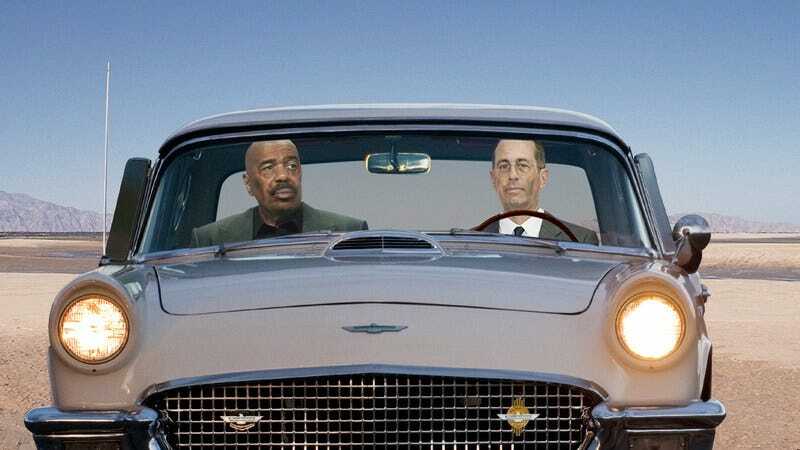 In a life-and-death struggle for survival that is only becoming more desperate by the second, Jerry Seinfeld and his fellow comedian Steve Harvey have been driving a classic 1965 Ford Thunderbird through the desert looking for coffee for the past 18 days. What a dark day for comedy fans around the world. This terrifying situation began more than two weeks ago when Jerry Seinfeld picked up Steve Harvey in a mint-condition 1965 Ford Thunderbird for an episode of Seinfeld’s popular web series Comedians In Cars Getting Coffee. Unfortunately, on the way to the café, Harvey distracted Seinfeld by telling a humorous anecdote about a suit he once bought that was too long for his legs. Seinfeld was so in riff mode that he made a wrong turn and ended up in the middle of the Mojave Desert. The two comedy legends have been driving through the vast expanse of sand, struggling to find their way back to the café ever since. After 18 days trapped in the beautiful T-bird with no food and being forced to ration the water in the canteen that Steve Harvey carries with him wherever he goes, Seinfeld and Harvey both look incredibly sick and emaciated. They definitely need to find their way out of the desert and get some food soon, or this already dire situation could take a turn for the tragic. Making matters worse, Jerry Seinfeld cannot use his phone to call for help because the only contact in his phone is the name “Jason Alexander” with no number attached to it. Twelve days ago, Seinfeld called the police and asked them to come save him, but he didn’t stop driving, so by the time the police arrived, he and Harvey were hundreds of miles away, even more lost in the desert than before. There’s no way of sugarcoating it: This is definitely a desperate situation for Jerry Seinfeld and Steve Harvey. Every day, their beautiful vintage car carries them deeper into the desert, and the stand-up legends get hungrier and hungrier. All we can do now is cross our fingers and hope that they make it out and find some coffee as soon as possible. Our hearts go out to the Seinfeld and Harvey families during this trying time.